The State Director of Iowa respectfully submits the following report. L.U.L.A.C. National Supreme Council Meeting Joliet, ILL. March 6, 7, 8, 1969 Greetings from the state of Iowa. Since the Supreme Council held in Washington D.C., I have been busy trying to solve that old problem of communications between my office and the three active councils here in Iowa. One solution is to ask for more money and then the letters start to come in. Actually, the problem of communications has improved somewhat here in Iowa. On Nov. 10,1968, I went to Cedar Rapids, Iowa to talk to a group of Mexican Americans about the possibility of forming a LULAC Council there, but they were only interested in the social aspects of LULAC. Needles to say that we already have too many socially orientated members in LULAC. I attended the Midwest Conference on Dec. 7,1968 in Gary, Ind. 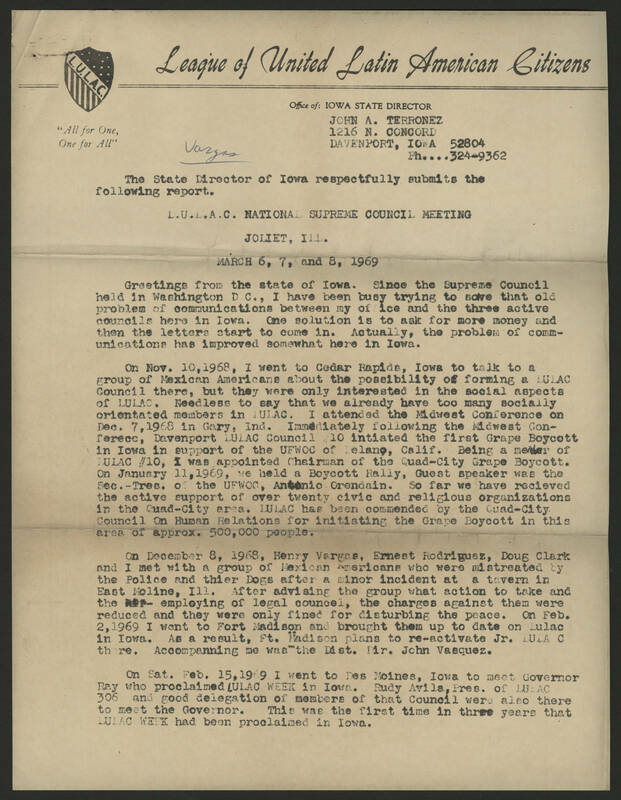 Immediately following the Midwest Conference, Davenport LULAC Council  initiated the first Grape Boycott in Iowa in support of the UFWOC of Delano, Calif. Being a [illegible] of LULAC #10, I was appointed Chairman of the Quad-City Grape Boycott. On January 11,1969, we held a Boycott Rally, Guest speaker was the Sec.-Tres of the UFWOC, Antonio Orendain. So far we have recieved the active support of over twenty civic andreligious organizations in the Quad-City area. LULAC has been commended by the Quad-City Council On Human Relations for initiating the Grape Boycott in this area of approx. 500,00 people. On December 8, 1968, Henry Vargas, Ernest Rodriguez, Doug Clark and I met with a group of Mexican Americans who were mistreated by the Police and thier Dogs after a minor incident at a tavern in East Moline, Ill. After advising the group what action to take and the [illegible] employing of legal councel, the charges against them were reduced and they were only fined for disturbing the peace. On Feb. 2,1969 I went to Fort Madison and brought them up to date on Lulac in Iowa. As a result, Ft. Madison plans to re-activate Jr. LULAC there. Accompanning me was the [illegible].Dir. John Vasquez. On Sat. Feb. 15,1969 I went to Des Moines, Iowa to meet Governor Ray who proclaimed LULAC WEEK in Iowa. Rudy Avila,Pres of LULAC 306 and good delegation of members of that council were also there to meet the Governor. This wass the first time in three years that LULAC WEEK had been proclaimed in Iowa.